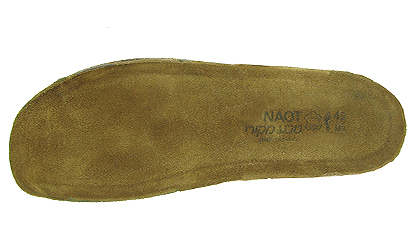 Naot footwear makes use of the most comfortable natural materials to create shoes that are flexible and supportive. Our footwear, manufactured in Israel, combines the comfort of suede, jute, cork and latex composite with footbeds that feature arch and cushion support. Latex padding provides superb shock absorption, while our EVA rubber soles are the most durable on the market; we’re proud to announce that testing has shown that Naot’s soles last twice as long as those of the competition. 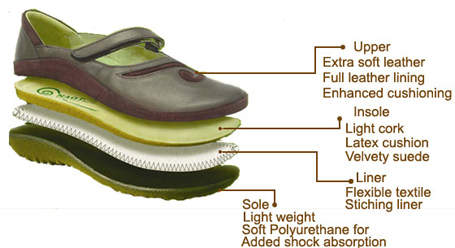 Many styles of Naot footwear include removable footbeds and adjustable straps for greater adaptability and comfort. Choose from full-grain leathers, suedes, and nubucks in a wide variety of colors. Naot brings the best of the natural world together in footwear that’s both comfortable and proven to last through your most strenuous daily activities.